Filmmaker Thomas Ellis, and sculptor Aastha Chauhan are on a 30-month movement of love for our beloved city, and have brought together the government, NGOs and the people of Delhi. Delhi, I Love You is a movement that has caught the attention of Dilliwalas and brought them together to shower love on this city of ours. The duo, Thomas and Aastha, aimed to connect government organisations, NGOs, youth, creators and the people of Delhi and create something extraordinary. They are in the process of curating 120 events across the city that celebrate the past and the present. The events will culminate in a feature film that will come as the fourth installment of the Cities of Love series, after Paris Je t’aime, New York, I Love You and Rio, Euteamo.You might have recently noticed the painted flyovers at ISBT. If you haven’t, then we must urge you to go check it out. The winning tweets from their event on twitter, #mydillistory have been featured as painted murals on the flyovers, and they look gorgeous. 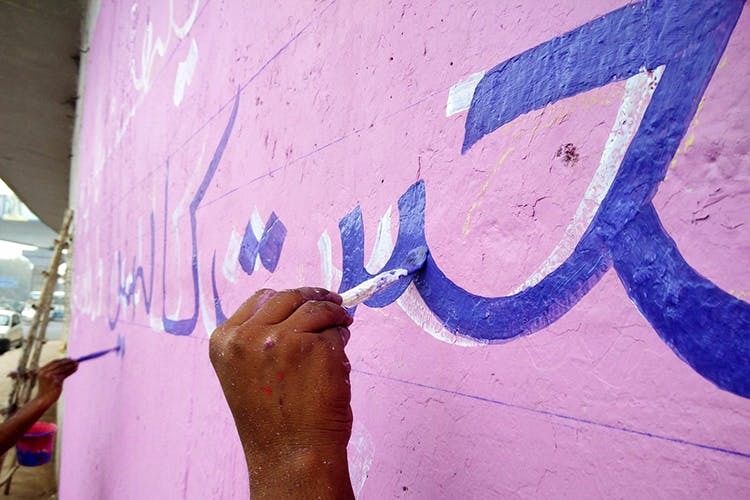 The entries came in thousands, in Hindi, Urdu, English and Punjabi, and the campaign became a project for supporting unemployed signboard painters and give them visibility. After having painted three tweets at the Saket City Hospital, Ambedkar University and New Delhi Railway Station, DILY has now painted six tweets professing their love for Delhi. A few lines include, “They said time travel was impossible. And then I visited Old Delhi,” and “E sheher teri shaan me hum kalam karte hain, mere hosle bhi ab tujhe salam karte hain.” We are all for this kind of PDA, no? So go have a look-see and feel a little pride.